Dr. Condro did her undergraduate work at Manhattan College, earning a degree in Biology. She then attended New York College of Podiatric Medicine, graduating in 1989. 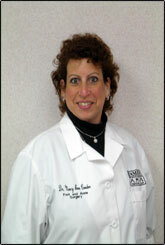 She served several preceptorships in the New York City area before joining Family Footcare Group in 1991. She is board certified by both the American Board of Podiatric Orthopedics and Primary Podiatric Medicine as well as a fellow of the American Association of Hospital Podiatrists, and is an active member of the Mid-Hudson division of the Podiatric Medical Society of the State of New York. Dr. Condro is currently a member of the Podiatry staff at Catskill Regional Medical Center in Harris, NY. July 1990-July 1991, Internship Lutheran Medical Center, Louis Arancia, D.P.M.